The Welfare of Anaesthetists Group has been meeting on a regular basis since August 1995. The group was formed to raise awareness of the many personal and professional issues which can adversely affect the physical and emotional well-being of anaesthetists and intensivists at all stages of their careers. In 1998 the group became an official special interest group (SIG), with ANZCA providing the secretariat. The group is an informative, educative and referral group; it has no therapeutic role. The aims of the Welfare of Anaesthetists SIG is to promote the personal and psychological well-being of anaesthetists and pain medicine practitioners and to heighten awareness of welfare issues in anaesthetists. Educating anaesthetists and trainees in the care of their personal and psychological health, and that of their colleagues, fostering a climate of care, openness and support. Identifying issues causing stress in anaesthetists’ lives. Establishing guidelines for management of welfare-related problems (see Resources). Expanding continuing medical education activities to include education on issues such as lifestyle, mental health, relationships, stress management and personal development, by holding sessions at state and national meetings, one-day seminars, and regional seminars for trainees and trainers. Developing support strategies within and outside the profession. Establishing a website, a resource brochure, a resource network and a reading list. Facilitating access to, and liaison with existing helping agencies (for example, Doctors' Health Advisory Services - DHAS). Advertising welfare activities and support schemes (in ASA and NZSA newsletters, ANZCA Bulletin). Liaising with ANZCA, ASA, NZSA and other organisations. The Welfare of Anaesthetists Special Interest Group was formed to promote the concept of physician health, both physical and mental. It is our intention to make physician health issues mainstream and regarded as integral to healthy doctor-patient, doctor-family and doctor-workplace relationships. Our activities include, (but are not limited to): Education (trainees as well as specialists), liaison with other professional bodies, guidance (but not direct treatment or referral) for appropriate management of physician health problems. Research and data on welfare issues in Australian/New Zealand anaesthetists. Wide acceptance by professional bodies and health administrations of the importance of welfare issues. Development of workplace practices that support anaesthetists and keep them well. Plenary sessions at major continuing medical education meetings. Annual state-based meetings on welfare and professional issues for trainees. The 2019 Combined Communication, Education, Welfare, and Leadership and Management SIG meeting will be convened by the Leadership and Management SIG and will be held from July 26-28, 2019 at the Novotel Sydney Manly Pacific. The theme of the meeting will be “Developing leaders with 20:20 vision”. Registrations are now open. Please click here to visit the meeting website. "Turning potential into performance", convened by the Medical Education SIG. Held September 21-23, Byron at Byron Resort and Spa, Byron Bay. Please visit the meeting website to view the presentation slides. "Confident competence - creating and maintaining our abilities", convened by the Welfare SIG. Held October 27-29, Novotel Twin Waters, Sunshine Coast, Queensland. Please visit the ANZCA Welfare SIG page to view the Welfare SIG Resource Documents. If you would like to create or request a specific resource document, please click here to view the resource document submission guidelines. Welcome to the first ANZCA Welfare SIG ‘article of the “month”’. The topic of substance abuse amongst our colleagues has frequently and recently been discussed by the SIG. This article sought to establish how common the problem is, who it affects and what is being done about it in our region. The survey has recently been repeated and the results will be published soon. Until then, let us review where we were in 2005. Also keep a look out for our ‘article of the month’ in the ANZCA Bulletin. Are you enthusiastic for long, difficult or complicated cases? Do you volunteer to work extra shifts or to do extra or late cases on a list? Are you over-anxious to give breaks to your colleagues? Did you know that these are some of the warning signs of drug abuse, according the Association of Anaesthetists of Great Britain and Ireland (AAGBI)? These attributes are also those which are generally valued by anaesthetists, which highlights how difficult it can be to recognise substance misuse amongst our colleagues. For more warning signs and for strategies on what to do when you suspect someone may have a substance abuse problem, I encourage you to read the Welfare of Anaesthetists Special Interest Group resource document RD 20 Substance Abuse 2013. This and other resource documents can be found on the ANZCA website here. All articles below are "produced by the Australian Society of Anaesthetists and reproduced with permission"
If you would like to join the Welfare SIG, please download an application form or contact events on +61 3 9510 6299. The executive of the Welfare of Anaesthetists SIG meets regularly, usually via teleconference to discuss matters related to the group's area of interest. 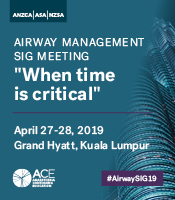 A business meeting will be held on Friday May 3, 2019 from 10-11am during the ANZCA ASM in Kuala Lumpur. Articles in ANZCA Bulletin, ASA newsletters and other publications. Doctors’ health advisory services numbers in ANZCA Bulletin and ASA newsletter. Liaison with ANZCA, ASA, NZSA, doctors health advisory services, regional medical boards.